Yellow diamonds have captured the public imagination, especially in the form of beautiful engagement rings. "Since the appearance of natural fancy color diamonds on the red carpet years ago, they have come into vogue," says Jerry Ehrenwald, International Gemological Institute (IGI) President and CEO. "Fancy color diamonds are regarded as desirable mainly because they show their natural color, as opposed to colorless and near colorless diamonds." There are many beautiful ring styles featuring yellow diamonds, and shopping for them is easier than ever. When you're choosing a yellow diamond for your engagement ring, be sure to give some thought to its color. According to Ehrenwald, this can be a very significant factor in a gem's value. 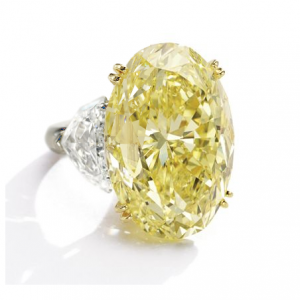 Ehrenwald says, "The more saturated the natural color, the more valuable the yellow diamond, if all else is equal." Carat weight, clarity grade and the diamond's proportion matter. However, according to Ehrenwald, "the key, and single most important factor, to natural yellow diamonds' value is the strength of color." Darker and deeper yellows are worth more than lighter yellows; however, you can also choose based on personal preference. If you prefer a lighter yellow for your ring, that's the right shade for you. Whether you prefer light or dark yellow, you need to understand the color rating system before you begin shopping. Ehrenwald adds, "Two additional sub-categories are fancy deep yellow and fancy dark yellow." You can either start by finding a yellow diamond you love and then choosing a setting for it, or you can purchase a ring that's already been assembled. Either way, you'll have lots of options. Some retailers specialize in both natural and lab-created loose yellow diamonds. The advantage to buying a loose gem is that you can focus solely on the diamond's quality and choose the gem that you really want. Fancy Diamonds has an extensive inventory with over 300 yellow diamonds. You can sort them by color intensity, as well as price and carat weight. They come with certificates of authenticity. IceStore also allows you to sort its inventory by carat weight, clarity, color intensity, and shape. Every gem in its inventory is certified by the Gemological Institute of America (GIA). On the other hand, you can also purchase a complete engagement ring. One advantage to buying your yellow diamond this way is that it's convenient. You can see your ring right there, without having to envision how the gem might look in different types of settings. Whether you decide to buy your yellow diamond and choose a setting for it or purchase a complete engagement ring, you'll have lots of style options and shopping choices. The following styles are among the most popular. The simplest setting for a fancy yellow diamond is a solitaire. This type of ring is perfect if you plan to wear your wedding ring on the same finger as your engagement ring. Tiffany Bezel Yellow Diamond - Tiffany & Co. offers canary yellow diamonds in a wide range of shapes and carat weights. Set in an 18k yellow gold bezel setting, this diamond's bright color is enhanced by the surrounding metal. Prices for these rings vary depending on the diamond you select. Canary Fancy Radiant Cut Solitaire - This simple solitaire from King of Jewelry features a 1.15-carat radiant-cut yellow diamond set in 14k white gold, with 0.25 carats of round-cut diamonds pave set along the shank. This ring retails for about $5,000. Rings that mix yellow diamonds with colorless accent diamonds are even more popular than solitaire styles. These engagement rings can range from simple to very ornate, and they may or may not accommodate a wedding band on the same finger. Often, for more elaborate styles, you can purchase a ring wrap or move your engagement ring to a different finger after your wedding. Adonis Rose Yellow Diamond Ring - This exquisite De Beers ring features a one-carat or larger round yellow diamond as the centerpiece. Marquis-cut diamonds and pave-set diamonds accent the platinum band. Price is dependent upon the diamond clarity and carat weight. 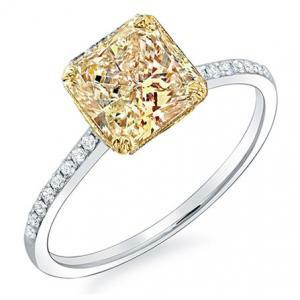 Natural Canary Yellow Diamond Ring - This ring from Reeds Jewelers has it all. A 1/4-carat natural yellow, cushion-cut diamond glows against the surrounding colorless diamonds. Dozens of round diamonds enhance the setting and flow around the 14k white gold band. This ring has a price of about $1,900. Three-stone rings are also very popular. In these rings, a central yellow diamond is flanked by two colorless diamonds. Typically, you'll need a specially shaped wedding band to go with this style, since there may not be room for a standard band. Radiant-Cut Yellow and White Diamond Three Stone Ring - This one carat total weight ring from Gordon's Jewelers is a vintage-inspired design. It features three radiant-cut yellow diamonds, bordered by small white diamonds, on a shank of two-tone 18k gold. This ring retails for just under $6,000. Fancy Yellow and White Diamond Ring - This beautiful ring from Ross-Simons features three yellows diamonds totaling 1.52 carats, each surrounded by .92 carat total weight of white diamonds for a total weight of 2.12 carats. The setting is 18k white gold, and the ring retails for about $36,000. No matter which style you choose, keep some very important shopping tips in mind. Because of their popularity, there are plenty of low-quality imitation yellow diamonds on the market. Ehrenwald provides a simple solution to avoid these. "When purchasing a yellow diamond, ensure that your diamond is accompanied by a lab report issued by a credible gemological institute, such as IGI," he says. "After obtaining a report, and therefore knowing exactly what you are paying for, all that is left is for the consumer to be captivated by the beauty of the stone." As you shop, you'll encounter natural, treated, and lab-created diamonds. Natural diamonds, or those without any type of treatment, are the most valuable and also the rarest. Many diamonds have been treated in some way. Ehrenwald explains that lab-treated diamonds can undergo various processes to bring out their yellow color, including heat treating or pressure treating (HT/PT), irradiation, and combinations of the two. They can also have a coating applied. These treatments may or may not change over the life of your gem. "Irradiation and HP/HT are stable treatments," he says. "Coating, another treatment of applying surface color to the diamond, is not a stable treatment and could be removed. If a diamond is treated by irradiation, HP/HT, or a combination of treatments, and the diamond is then treated again in a similar manner, its color could change. Otherwise, irradiation, HP/HT, and a combination of these treatments are stable. You can find out if your diamond has been treated by looking at its certificate of authenticity or having it examine by gemological institution like the IGI. Lab-created yellow diamonds are an affordable option if the cost of natural canary diamonds places them outside your budget. According to Ehrenwald, these lab-created natural diamonds are quality stones. "Lab-grown diamonds are scientifically the same as natural diamonds; however, they are made by man and not in nature," he says. "Consumers should be aware of lab-created diamonds as an option, as these are also available in fancy yellow." Ehrenwald notes that lab-created yellow diamonds are not as valuable as their natural counterparts. However, it may take an expert gemologist to be able to tell the difference between an engagement ring with a lab-created diamond and one with a natural yellow gem. When shopping for a yellow diamond engagement ring, you have a wealth of options. You can choose a lighter or darker gem, one that is natural, treated, or lab-created, and one that is pre-set or loose. No matter what you select, you'll end up with a lovely engagement ring that's sure to be noticed amid its colorless counterparts.